Every year, the changing island weather prompts me to write, like a patient writing instructor prodding its lazy student. To get my attention, the island lobs cranberry-orange sunsets at me and tempts me with the sound of clattering trees or rolling beach cobbles. And then I ache to write, usually. This fall, I dared to remain sullen and shunned my keyboard. One morning, the island retaliated by tossing a surf-worn, sandy book at my feet as I walked along the beach below my home. I was as surprised to see a book floating in the surf as I would have been to stumble across a baby seal sitting on the sand. Picking the book up, I recognized the black moleskin cover that protects beloved journals. Sea-soaked, the cover had warped wildly, but the pages clung stubbornly to the binding. I felt guilty at the prospect of touching a writer’s private possession and yet shouldn’t I rescue it from the waves and try to identify its owner? Prying the journal open carefully, I peered at blurred handwriting. The disintegrating pages spoke of an old man wearing snakeskin boots, walking alongside the author as osprey soared overhead. But the “In case of loss return to:” line remained empty. There was no way to know how far it had floated before it washed up at my feet like a literary message in the bottle. Unsure of what to do, I carried it home to dry it out. The salty pages are wavy and brittle now. 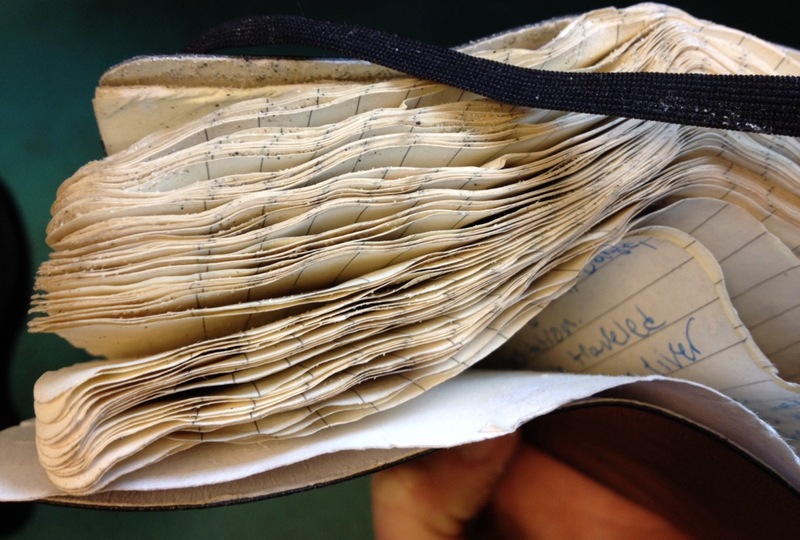 The well-traveled moleskin journal could be considered flotsam worthy of the trash. Yet, saving it reminds me to keep writing. Of course, if the journal belongs to you, please let me know. Most popular articles ring in the New Year! Beautifully written, Trish. It could be the beginning of a novel! What secrets could be hidden inside that soggy journal? Lovely, Trisha. There’s such fascination in the chance to get a glimpse of another life, not through the outward public presentation, but through the random, interior bits and pieces of journal writing. I highly recommend the book, A Tale for the Time Being, by Ruth Ozeki, who weaves an entire novel out of just such a find.